eGalax Touch Screens are not always USB-HID Compliant. eGalax Touch Screens are not always USB HID compliant and if they are not USB-HID Compliant then they are not Windows Vista/7 Touch Compliant . Let’s start by saying that the eGalax Touch Screens made by EETI uses a Touch Resistive Panel Controller (it can be capacitive but most UMPC and Tablet PC use the Resistive one) that can be connected using 3 different interfaces: USB (Hardware ID: USB\VID_0EEF&PID_0001 or USB\VID_0EEF&PID_0002), RS232 (Hardware ID: SERNUM\EGX5800, SERNUM\EGX5900, SERNUM\EGX6000, SERNUM\EGX5901 and SERNUM\EGX5803) and PS/2 (Hardware ID: *PNP0F13). How do you know if you have a eGalax Touch Screen? You can find the hardware ID of your touch screen using the Device Manager. 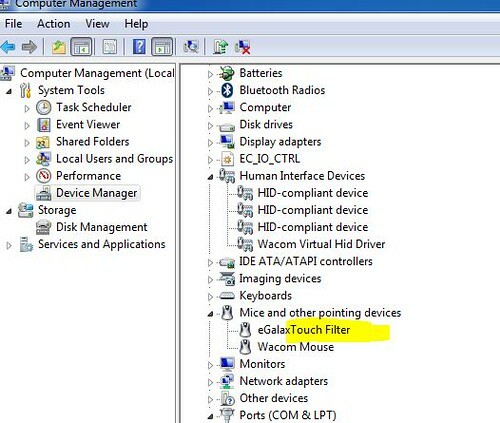 If you have a HID Compliant eGalax Touch Screen it should be listed under Human Interface Devices if you don’t see it there then it should be listed under Mice and other pointing devices. In either case if you do a right click, properties on top of the device you will see the following screen where under Details, Property, Hardware IDs, you can find the hardware ID for the installed device. Once you have found that you have a UMPC or Mini Tablet PC with a eGalax Touch Screen and you have found what kind of interface it’s using by comparing the Hardware ID with the list I gave at the beginning of this article what do you need to know. If you have a RS232 or a USB interface most likely that your device is USB HID Compliant and you will see it listed in XP under Human Interface Device, if that’s the case then in Vista or W7 you will see it listed in that category and you don’t have any problem. But I said most likely because I had the situation in the past where a device with a USB Interface (Samsung Q1) did not have HID support because the eGalax drivers was not prepared with the HID protocol. 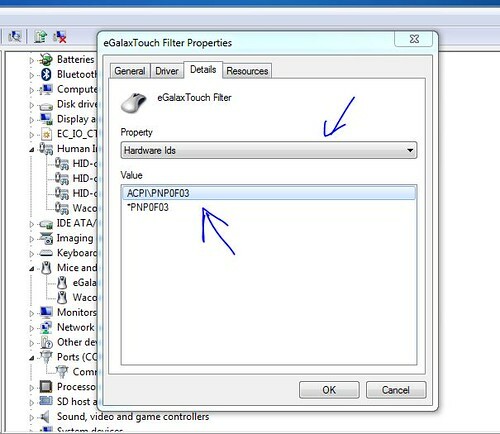 If your device is using a PS/2 interface most likely you will never see any of the Touch Features of Windows 7 and Vista because your device is not HID Compliant. HID means Human Interface Device. right click confused by the OS as a click. No Ink support in Office and Outlook. No Ink recognition software (In Tablet PC Edition, the recognition software is present but does not work properly. All Tablet PC functionalities from Control Panel are missed. These missed or “no working properly” features do not sound that important for somebody that never has used them. But any person that has used before a touch screen with HID support or a Tablet PC will have a hard time trying to use on of these devices. To give you an idea, when I switched from my Tabletkiosk eo V7110 to my Samsung Q1, I ended using more the eo than the Q1 just because I could not get used to to the fact that I did not have these features in my Q1. And the Samsung Q1 was a better device. I only started using for real the Samsung Q1 when I received the eGalax Beta Drivers with HID support. One important note, after I received those drivers EETI released many version of the Touchkit and in none of them included the HID Support needed for the Samsung Q1. And we are talking about something that happened back in 2007. This means that if you do not have HID Support from Touchkit (Touchmon) at this moment the possibility of getting it in the future is almost none. Installing W7 in a touch screen device without HID Support does not make too much sense to me because you are missing the best part that W7 brings to these type of devices. Without these features you better stay with Windows XP. Will I buy a Touch Screen Device that is not HID Compliant? The short answer is NO. I'll be missing if I buy one part of the functionalities of Windows 7 has designed to work with Touch Screens. Functionalities that have been described many times as the best you can find in any Operating System in the Market. I'll be missing the best Handwriting Recognition Feature currently available in the market in any Operating System. Why UMPC and mini Tablet PC makers use an interface that is not HID? One of the reasons is because Microsoft is not distributing any more Windows XP Tablet PC 2005 Edition. OEMs are installing Windows XP Home edition in these devices and this OS does not come with any touch screen features. If you don’t have any touch screen features supported by the OS then you can go away by using the PS/2 interface because your screen just acts like a simple mouse. Now you are informed, it’s your choice to do an educated decision about to buy or no to buy a device with a touch screen that is not HID Compliant. In fact, we all should request OEM to include that in the specifications of their machine or to ask Microsoft to request from OEM using Windows Vista or 7 in a touch screen device to specify if it’s HID Compliant because from this single point depends whether you will have or will not have all the Operating System Touch Features. Can this be fixed with a driver update? Well, I have seen it fixed before. I don’t know if that can be done for the PS/2 interface but at least one thing is for sure, EETI is about to release the drivers for Windows 7 and there is not any HID support for this interface. Since I installed Windows 7 Ultimate my P1610 was waking up from Hibernation by itself every morning at 8:05 AM. After few hours of research in the web I found that the cause of the problem was Media Center. The problem is that most of time at that time my P1610 is in it's case and without a proper ventilation it was getting extremely hot. Something really no good for the CPU. The solution, in the device manager, task scheduler (see picture). Unchecking the option to Wake the Computers to run this task, probably is enough to fix this issue. In my case I'm not recording anything in Media Center, so I disabled the task. A drastic decision that put end to the Mystery that was jeopardizing the integrity of my lovely P1610. Thanks to Dynamism I had the chance of testing a Viliv x70 and even more, install W7 on it. This is not a guide, these are just few notes about the process. The device has only one USB port, buy a little USB port where you can connect your USB Mouse, keyboard and a bootable USB Memory stick with Windows 7. I used this tool to prepare the USB Memory. Download from Viliv all drivers and uncompress them in a folder in your bootable USB. Windows 7 wont recognize the WiFi and the Touch Screen. This is why is so important to have the WiFi driver ready. The touch screen driver that I recommend is the eGalax Beta for W7. Still this is not a HID and as result Windows 7 will not recognize this device as a Tablet PC or a device with a digitizer. This means that you will miss some of the touch features that we love very much from Windows 7. To boot from the USB, turn on the unit holding pressed the button B. Using the Joystick select the option of booting from the USB. To install W7 select the 24 Gb unit, click in advance, and format. When the installation of W7 is done, install the WiFi, reboot and run windows update. Once you have installed the updates then install the touch screen driver. Check the device manager, you will find a device marked with !, update the driver using the files in the folder EC_IO downloaded from Viliv. Keep installing the rest of the software download the Viliv. For CubeUI you will need to download Air from Adobe. The Viliv X70 overall performs better than my P1610 with a better CPU. The Viliv X70 only needs one thing, a HID for the touch screen . What a crime to have a wonderful device like this no using fully all Touch features of Windows 7 and Office (No ink support). Well, W7 does not recognize the touch screen as a HID, in another words, as a digitizer. It recognize it as just a mouse. The problem with this is that most of the touch functionalities of W7 do not work properly in this case. The ink experience is just frustrating. The same thing happened with the original Samsung Q1. Back there, I found a work around and I’ll be exploring that route today. For somebody coming from using a Tablet PC or an UMPC with digitizer the Viliv X70 will be a step backward unless there is a solution for this issue. There are options to make the inking experience better but still you are missing all the potentials of a very good “Touch” Experience. This machine has a lot of potential and I love it. But this issue needs to be addressed. I’m going to post in Twitter all the details about this process. Posted already few things that I’m preparing and will continue with the whole process at 7:00 PM EST Today. The Crime: Install Windows XP Home Edition in a Viliv X70. Punishment: Keep using it without enjoying all the features touch relative available in Windows 7. One of the best scores I have seen thanks to a super fast SSD. It's without any doubt faster than my P1610. Thanks God, I have been authorized to install W7 in this demo device and I'll do it tomorrow ending my punishment period. I showed today the x70 to my coworkers, IT Pros with many years of experience. In a brief interview I asked them two simple questions: What they like it and what they did not like it. Here is a photo report of the unboxing of the Viliv X70. I received a Viliv X70 review from Dynamism and I have prepared a short video for my Spanish site I the video has subtitles in English, so do not worry I you wont have to learn Spanish. So far, the design is what have impressed me most of all. This UMPC looks really good, the space around the screen is well utilized and as result the device looks smaller than other devices with the same screen size. Windows Live Movie Maker has been finally released. Some users have found that you can import files into Movie Maker if they are located in the network. But there is a workaround to overwrite this. To run the roadblock, navigate to HKEY_CURRENT_USER\Software\Microsoft\Windows Live\Movie Maker and add a DWORD value named AllowNetworkFiles. Afterwards, simply double-click it and set its data to either 0 (disabled) or 1 (enabled). Ultra-slim, space-saving mini PC. Fits anywhere-table, living room or even the kitchen counter. Pair it with your TV to output to larger a screen and watch videos or play games. Lenovo used to be an IBM company that made and designed their own machine. Lately (After it was bought by a Chinese based company) I have experienced issues in their machines and now I found that they are just rebranding machines made by somebody else. BTW, I just received a second version of the Ruvo Mini Cap 7 but this time using a different graphic chip, it’s not using the SIS and I’m expecting to see a better performance in this one. A fully-powered seriously-miniaturized Windows notebook that fits in your pocket has finally arrived! The world's smallest PC is the UMID mbook M1 and it is brought to you exclusively by Dynamism. The M1 is one of the smallest (or the smallest at this moment, I’m not sure) PC in the market. Yes, there is a new kid coming to town according to news posted at InformationWeek and this page that promises information whenever becomes available. Marc Andreessen, who developed the Netscape browser that brought the Internet to millions of people in the 1990s, is reportedly backing a startup that believes it has a better browser. Netscape was an interesting browser that could not hold Microsoft’s push. But… It’s coming back now that we have Google, Apple, Opera and Firefox fighting against Microsoft supremacy. What exactly RockMeIt will bring new to this busy market? Yes, there are few pictures posted in Engadget that shows the new Smartphone from Dell. The 3.5-inch 360 x 640 pixel device with capacitive touchscreen was on display in China running the Android-based Open Mobile System (OMS). The Mini 3i was on-hand as part of the launch of China Mobile's new Application Platform that offers music, video, and app downloads to mobile phones from Nokia, Samsung, LG, and apparently, Dell. And it will be using Android, so Dell said bye bye to Windows Mobile and joined Google’s club. An independent study has found that IE8 is the browser blocking Malware and Phishing sites. IE8’s SmartScreen Filter has delivered more than 70 million blocks in the first four months since IE8’s official release, for a cumulative total of 80 million blocks. This data is a strong indication of the value of the protection SmartScreen provides, and of just how widespread socially-engineered malware attacks are on the web today. If you don’t have the money to buy Adobe Photo Shop then you will be happy to know that Paint .NET is free and an excellent tool capable of replacing Photo Shop in most of the tasks. Today I read at Windows Experience Blog that the latest version of this tool started to use DirectWrite, the latest update in the DirectX family. DirectWrite is one of the new additions to the DirectX family of APIs in Windows 7. DirectWrite enables better readability, adds support for a large variety of languages and scripts, and in conjunction with Direct2D provides superior rendering performance for Windows applications. Applications can also use DirectWrite with GDI and carry forward existing investments in the Win32 code base. You can read more about DirectWrite here. The best porcelain in the world comes from China, at least that’s my opinion, no wonder here in the west we call it China. 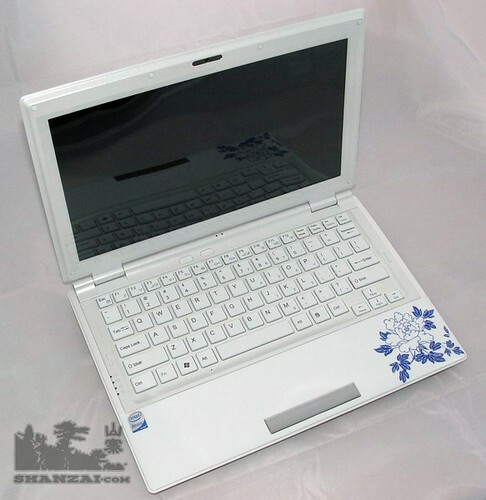 Shanzai.com has spotted a Netbook with an Intel Processor and an unusual display of 11.1 inch 1366 x 769 pixel that has a beautiful China design. This weekend I downloaded W7 RTM and decided to install it in my P1610. I had it before installed in that machine in a second partition and I installed multiple builds always starting from 0. The whole process always took me from 45 to less than 1 hour. With the RTM I decided to upgrade my first partition where I had Vista installed. I had a lot of programs installed there so I thought that the upgrade was going to be quicker than reinstalling everything. I was wrong. The upgrade process took more than 5 hours. After that I discovered that for some reason all the USB Devices were not working because the drivers for them were not installed properly, something that never happened before in my clean installs. Another 5 hours went into the process of finding what was causing the problem. PortShooter, a program created by Fujitsu to protect your laptop from people using the USB ports to copy stuff out of it was causing the issue. The worse thing, this program can’t be uninstalled if you do not go into the program typing a password and select the option for Uninstalling. Even worse, that password for some reason did not work anymore in W7. I had to uninstall manually the program editing the registry and deleting everything relative to the program and all changes made by the program in all the USB drivers configuration keys. Summarizing, a clean install would have saved me time. Another thing to point. For some reason, I feel that W7 is not as responsive as when I had it in my second partition where I always did a clean install. One of the reason for this is because some of the hacks that I applied to Vista to speed up the system do not work well in W7. I have undone them but still, my upgrade still not at the level I wanted. But I’m too lazy (and I like to be challenged) so I’ll keep digging looking for what to do to make W7 as responsive as it was in a clean install. GottaBeMobile has posted a video today about how and why you save money using a Kindle. There is a lot of controversy lately after Amazon deleted copies of the book 1984 when the company found that this book was being sold illegally at Amazon. Should they have done that? The answer is no, that was a stupid decision. But still, I keep saying and repeating, the best gadget that I have ever bought is the Kindle. I’m more for a Social DRM than the traditional one, I have paid for my books and I feel that I should be free of reading it in any device I want. And currently you can’t do that with your books bought using the Kindle. So, I’m not saying that the Kindle is perfect but at least is the first step in the right direction. Finally it’s official. Sony is releasing two new ebook readers, the PRS-300 for $199 and the PRS-600 for $299. Sony is today delivering on its promise of making digital readers and eBooks accessible and affordable for consumers with the introduction of two new Readers. Part of a new Reader line, the Reader Pocket Edition™ puts a library in your hands for as little as $199. Both the Reader Pocket Edition and the Reader Touch Edition™ will be available at the end of August, at SonyStyle.com, SonyStyle stores and select retail partners. Also, new releases and New York Times bestseller titles in the eBook Store from Sony will now be available for $9.99. Good news, the eReaders are becoming more and more popular and if you have not bought one yet consider then for your Christmas wish list. You will never regret it, I can tell you that from my own experience, my Kindle is my best investment in the last 10 years. According to Wired.com, Dell and Intel are preparing a Tablet PC that should be released “by the end of the first quarter of 2010”. Dell and Intel are just the latest examples of a growing trend. MKM Partners analyst Tero Kuittinen said he, too, has heard rumors about not just Dell, but also handset makers Nokia and HTC delivering tablets by end of first quarter 2010. Wired.com also points that this and the rumor about Apple’s Tablet PC may be a sign of 2010 being a good year for the Tablet PC Technology. Well, I would be extremely happy to see that. It’s not secret that I love TabletPCs. Is not it? I also should add that the release of Windows 7 is a very important factor that could contribute to make 2010 the year of the Tablet PCs. Tablet PC Blog has posted a nice article talking about what is different between the Handwriting recognition in Windows 7 versus the one in Vista which to many, including me, was the best recognition available for Tablet PC and UMPC owners. Thankfully, as Windows 7 hits the market with much better mainstream acceptance, Tablet PC users will no longer have to apologize for their choice of operating system! There are some significant improvements in the way that Windows 7 handles recognition, even after the leap forward that we had with Vista. 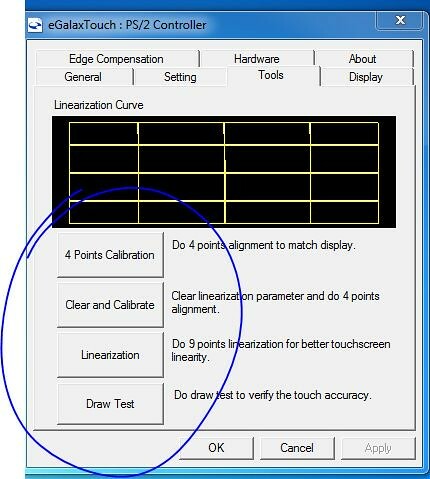 The article has few videos that shows the handwriting recognition of W7 in full action. Engadget has published today a screen shot where W7 is asking during the installation what browser do you want to use. This is done to satisfy the EU. The saga of Microsoft vs. the European Commission just keeps on keepin' on. MS was accused of harming the browser competition by including IE with Windows, and as part of its pledge to play nice proposed a Europe-only version of Windows 7 that would completely lack Internet Explorer, dubbed Windows 7 E. Last week the company came up with an alternative: a so-called ballot screen version that would allow users to pick (nearly) any browser they like upon start-up -- or just stick with the already installed IE. Now my question is, will all OS ask the same? When you turn on a Mac in the EU will it ask for what browser do you want to use? What about Ubuntu? or the new Google OS?